Digital Chocolate is a leading provider of social games played across social networks and mobile platforms. The company's top hits include Galaxy Life, Millionaire City, Zombie Lane, Army Attack, Crazy Penguin Wars, Tower Bloxx, and Rollercoaster Rush. The iPhone version of Rollercoaster Rush was a Top Five download in the Apple App Store – and is part of a franchise that has achieved more than 15 million downloads. Digital Chocolate was the number one software company in App Store downloads in 2009, and was one of the fastest-growing publishers of Facebook social games with virtual goods in 2010. The company was founded in 2003 by Trip Hawkins, the founder of Electronic Arts, and has 300 employees.Headquartered in San Mateo, California, Digital Chocolate works with 200 leading web and mobile channel partners in 80 countries, and has offices in Finland, Spain, and India. As the popularity of Digital Chocolate's social games exploded, so did the company's IT infrastructure costs. COO Jason Loia migrated his infrastructure to Joyent Cloud hoping to achieve new levels of reliability and performance while protecting Digital Chocolate's profit margins across its games portfolio. In Social Games, you either manage your infrastructure or it will manage you, and no other provider did more to truly roll up their sleeves and understand our needs than Joyent. Recognizing the seemingly limitless potential of the social gaming space, Electronic Arts founder Trip Hawkins launched Digital Chocolate in 2003. After staking its claim in the mobile space, the company expanded its focus to online social games. Digital Chocolate quickly became a top game publisher, rapidly launching hit games to rival those of major competitors. To the delight of Digital Chocolate's leadership, the company quickly achieved success in a critical metric for online gaming companies: daily active users (DAUs). As Digital Chocolate's DAU base grew, however, so did its infrastructure costs. At first, supporting the explosive DAU growth was the company's primary focus. But as the business evolved and the complexity of supporting games increased, it became clear that Digital Chocolate required a more flexible solution to accommodate its needs. As Digital Chocolate continued to create new games and support existing ones, the company had to make sure its costs per DAU didn't exceed its revenue per DAU. With Digital Chocolate's incumbent cloud infrastructure provider, sudden bursts of bandwidth usage often drove up costs, jeopardizing the profitability of some games. Chocolate each day and games’ constantly-changing userbase, the company needed to work with a cloud infrastructure specifically built for today's most demanding applications. Digital Chocolate's specific needs? Instant scalability and the highest levels of performance. As Digital Chocolate evaluated potential cloud partners, it presented vendors with a wide variety of unique needs. For instance, due to the unpredictable and fragmented nature of its user base, Digital Chocolate was looking for a cost-effective way to perform iterative load testing, Digital Chocolate asked vendors to present pricing scenarios for various service level agreements (SLAs) – but most bidders weren't flexible enough to accommodate the company's wishes. Joyent approached Digital Chocolate COO Jason Loia with a cloud architecture design that would offer unparalleled efficiency and performance while reducing his company's infrastructure costs by 30% or more. Savings like these would allow Digital Chocolate to devote more of its resources to developing games, not just maintaining the infrastructure. Based on his experiences with his incumbent cloud provider's systems and discussions with other providers, Loia was initially skeptical about these promises. But he finally agreed to pilot one of Digital Chocolate's smaller game footprints on Joyent Cloud for a 60-day test. Within 45 days, Loia was a believer, and had begun migrating Digital Chocolate's entire game portfolio to Joyent. Joyent Cloud delivered the reliability and quality of service Loia had hoped for, while streamlining Digital Chocolate's infrastructure footprint. With Joyent, Loia gained cost predictability, deep visibility “under the hood,” and granular control over the exact dials he wanted to control. Joyent's cost-effectiveness has completely changed Digital Chocolate's cost structure. In fact, the profitability of each of the company's games dramatically improved once Digital Chocolate went live on Joyent. With lower overhead and the ability to project its infrastructure costs each month, the company is now in a much healthier position for sustainable growth. Loia believes a cloud provider doesn't really prove itself until the first product roll-out – but he reports that Joyent passed this test with ease. He appreciates Joyent's “solid SLA metrics,” no I/O fees, and performance that's “on par with the major incumbents.” The key to success? The Joyent cloud extends performance by allowing applications to instantly and automatically burst into large CPU pools at no charge. Each Joyent SmartMachine can burst up to 400% instantly to handle large spikes in usage or traffic. Quizlet is the world's largest flashcards and study games website. The company has grown astronomically from 100 beta users in 2007 at launch to 6 million monthly unique visitors consuming over 60 million page views as of October 2011. Information on Quizlet ranges from middle school social studies to university-level Arabic to GRE prep. Quizlet is free to users and ad supported. From middle school students to medical residents, Quizlet's users have created over 7 million flash card sets incorporating more than 200 million terms and definitions. Built by founder Andrew Sutherland in 2005 as a way to study for his high-school French class, Quizlet now includes advanced progressive learning tools that identify and emphasize knowledge areas where the user is weaker. This speeds the learning process. Ad-supported Quizlet has scaled from 100 beta testers at launch in 2007 to 6 million monthly unique viewers consuming over 60 million page views as of October 2011. Our application performance on Slicehost was much slower than on the Joyent Cloud. We know our application on Joyent Cloud runs super fast – across 100 million requests per week, our average response time is 40ms. That's partly because of Joyent's awesome hardware. We can run the entire site on just three (virtual) Web servers which I don't think would be the case on other cloud platforms. Losing user data that had been painstakingly uploaded would seriously damage Quizlet's reputation so Sutherland and his team wanted the most reliable file storage system in the cloud. And they wanted a cloud that had few if any unplanned outages. Quizlet users would be accessing the site from mobile devices and remote locations while studying. This meant they would be exposed to a far more diverse set of data delivery and network conditions so Quizlet would need to quickly analyze and troubleshoot any application latencies to tune apps for high-speed page delivery. Sutherland knew the value of having new servers. In a cloud environment, better hardware can make a huge difference to overall cloud performance. Because he was building Quizlet on the bleeding edge of Web application technology, Sutherland wanted fast support to ensure proactive fixes for any problem to prevent cascading failures that affect end users. Sleepy Giant runs games. Working with top developers and publishers in the game industry, Sleepy Giant provides the tools and expertise to design, launch, operate, and expand game user bases. An independent online game company headquartered in Newport Beach, California, Sleepy Giant is the leading market partner in delivering games-as-a-service. Joyent is backed by an excellent team of cloud infrastructure specialists. They recommended architectural options and software tools that gave us the ability to be more efficient and focus on our actual game application needs. Sleepy Giant was looking for a public cloud solution that provided flexibility in scaling infrastructure up or down at a moment's notice. Sleepy Giant also needed high availability, reliable support and a low total cost of ownership. Sleepy Giant needed a scalable and high-performance cloud infrastructure to provide high quality experiences for gamers. In the game industry, unpredictable usage spikes occur frequently as a result of organic, viral uptake and paid promotions. When these spikes happen, it is crucial that infrastructure be quickly scaled up. Every millisecond matters. If increased usage is not met with adequate infrastructure, then players suffer from decreased response times, the game experience deteriorates and opportunities are missed. Sleepy Giant needed a support team with the broad knowledge and competence to help build the right infrastructure for its partners. Sleepy Giant was seeking a team that could provide customized solutions and recommend proven options to meet the continuously expanding needs of its diverse projects. Sleepy Giant wanted to reduce infrastructure costs while continuing to deliver improvements in performance to customers. This meant considerations of alternatives to ownership and management of physical hardware. JA High-performance, Reliable and Scalable Cloud Service. Sleepy Giant chose to deploy on the Joyent Cloud because of Joyent's unique, purpose-built infrastructure and knowledgeable support team. The Joyent Cloud enabled Sleepy Giant to use resources efficiently for both its small and large partners. Joyent's SmartOS technology provided Sleepy Giant with a way to bootstrap new games and then quickly scale up for launches. Additionally, Joyent Cloud's unique CPU bursting capability eliminated the need for virtual servers in response to usage spikes. After starting with the deployment of a few servers, Sleepy Giant has grown its footprint to hundreds of Joyent web application servers, Riverbed Stingray load balancers, and Percona MySQL appliances for optimized, high-performance MySQL data stores. Sleepy Giant is able to take advantage of customizing the Joyent Cloud on the fly by adding or removing virtual CPUs, disk space, and RAM as needed. Sleepy Giant continually benefits from Joyent's up-to-date knowledge and involvement in cutting-edge technology. Joyent continually introduces new and improved ways of solving problems, whether the solution is one of its own offerings or one from a third-party vendor that compliments Joyent's offerings. Sleepy Giant was able to considerably reduce its total cost of ownership with Joyent's services. This means Sleepy Giant can allocate more resources in other areas that improve the overall game experience. We helped Reebonz – a Singapore-based B2C online retailer client – to prepare for future growth. Before it stepped into Fengqi.Asia, this shopping platform was operated with a managed hosting provider. A major challenge they were facing was that the infrastructure failed to scale with traffic demand. Fengqi.Asia Cloud assisted the client to build a scalable architecture with our SmartMachines. Benchmark results showed that the new platform can scale reliably with the expected business growth. More specifically, the client has reduced the computing resources from 240GB RAM (5 machines x 48 GB) for 5,000 simultaneous connections to 24GB RAM (6 SmartMachines x 4 GB). Memcache requirement has also been decreased from 5 x 4GB RAM to 5 x 2GB RAM. These imply an overall 80% saving of infrastructure cost. In addition, end-user latency and growing user numbers can now scales linearly rather than exponentially. 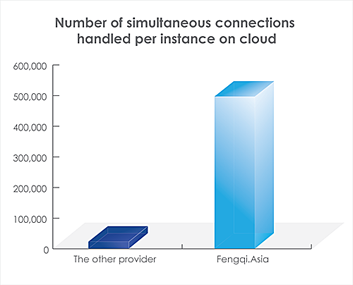 Before operating with Fengqi.Asia Cloud, a mobile app developer required a cluster of 20-30 instances on a public cloud to support 200K-300K concurrent connections. This complicated cluster architecture resulted in high cost of development and administration. Fengqi.Asia Cloud helped the client to replace the connection layer with Node.js SmartMachine. This modification only took 1 engineer-week to complete all the related code changes and testing. After switching to Fengqi.Asia, benchmark results showed only ONE 1GB RAM Node.js SmartMachine can handle over 500K concurrent connections and this has significantly reduced the number of instances the client required as well as the operation cost.